The Airport in Zurich, Switzerland, is as posh and modern as you’d expect in a country famous for its banks, but the sound you hear upon boarding the train into the city is the clanking of cowbells. Admittedly this is just a recording but the rustic chimes of the pasture continue in the valley as travellers gawk at cattle idling among the spectacular scenery of the Alps. This is the Jungfrau region, so named for one of the three great snow-clad peaks towering over it – Mounts Eiger, Monch and Jungfrau. As if the mountain range weren’t impressive enough, there are the gorgeous Lakes Thun and Brienz and, nestled in the toes of the Alps, the beautiful resort town of Interlaken. We are headed for “the top of Europe” – Jungfraujoch, at 3,454 metres above sea level Europe’s highest-altitude railway station. Everything up here is rock, ice and snow. The reason for this particular trek is that the famous cog railway celebrated its 103th birthday last month. Hauling millions of passengers each year, it was a pioneering achievement of Swiss engineering, and it still astonishes. The 1,400-metre climb from Kleine Scheidegg station to the Jungfraujoch – on a 25-per-cent vertical grade – is almost entirely within tunnels, every centimetre cut through granite with precision, in often extreme weather conditions. Today we can only imagine what a thrill this must have been for the first passengers a century ago, reaching altitudes that had previously admitted only the hardiest of mountaineers. Swiss industrialist Adolf Guyer-Zeller’s resolution in 1883 to build the railway has made the breathtaking panoramas atop Eiger, Monch and Jungfrau accessible to everyone. Guyer-Zeller “made the impossible possible” in the face of enormous challenges, Kessler says. “At first they planned to build the railway right to the summit of the Jungfrau, but that’s 4,158 metres and the weather conditions are bad, so they decided to stop midway. “In 1899, just three years after construction began, Guyer-Zeller died of pneumonia, but his family carried on his work. Never before has a railway been built at this altitude, under such extreme conditions. The labourers had to work long shifts among the glaciers at 2,320 metres. They used explosives to cut into the rock and there was an accident, an explosion that took the lives of 17 Italian workers. Kessler characterises the railway as “very simple, very primitive engineering, but efficient”, and it’s an assessment that King Rama V would have no doubt have confirmed when he rode to Kleine Scheidegg station at 2,061 metres on May 29, 1897 (before Jungfraujoch was built). It was one of many marvels he saw on the first visit to Europe by a Siamese monarch. The entire trip to Jungfraujoch takes about 90 minutes. Once at “the top of Europe”, there’s a wide range of activities available – though skiing back down is not one of them. You can watch a four-minute film called “The Jungfrau Panorama”, which offers a 360-degree experience of the station. You can ride Switzerland’s fastest lift to the Sphinx Observatory in a lightning 27 seconds. It’s been conducting astronomical research since 1931 and, from the outdoor terrace added in 1996, you get to gaze down like gods 3,571 metres, taking in sights such as the Aletsch Glacier. 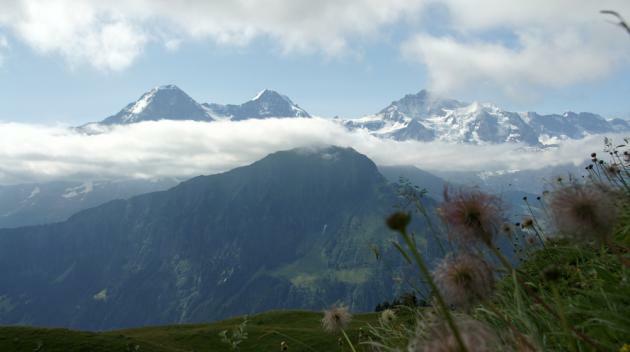 Climate change threatens to reduce Switzerland’s alpine glaciers from 75 cubic kilometres to just 25 in the next 50 years, so there’ll be plenty of fresh melt-water – and that’s about the only good thing you can say about it. Sphinx Hall is the starting point for a light-and-sound walking tour titled “Alpine Sensation”, which touches on tourism past and present and recounts Guyer-Zeller’s noble undertaking before ending at the Ice Palace, a huge cavern carved out by mountain guides in the 1930s. Crystalline sculptures of eagles, penguins and other things are kept artificially chilled so that visitors’ body heat doesn’t thaw them. Most of the year there are opportunities to ski and ride sledges, snow tubes and snowboards, but the more thrilling experience is a two-hour hike to the Monchsjoch Hut, which depends utterly on the use of ropes and crampons but is entirely safe. 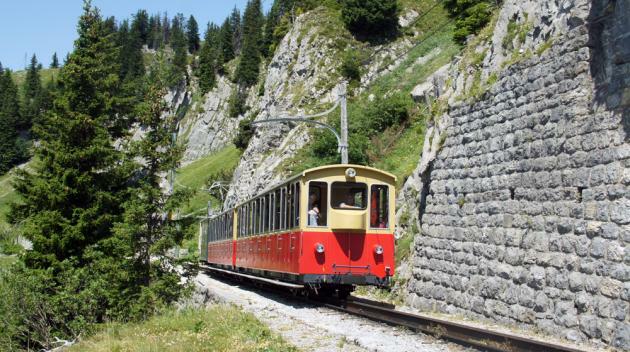 Interlaken is an amazing one-day train journey from Jungfraujoch railway. Even more exciting excursions can be arranged, but don’t bypass an evening meal atop Harder Kulm, the local high peak famed for its sunset views of the lakes and the taller trio of mountains that turn pink in the day’s yielding light. Romance is also in abundance aboard another historic cogwheel railway, this one climbing to Schynige Platte on a narrow-gauge track, passengers bunched together on wooden benches from a bygone era as the magnificent mountain landscape rolls past. The fresh air at the summit station is wonderful, the high triplets waiting in the distance for their photos to be taken. 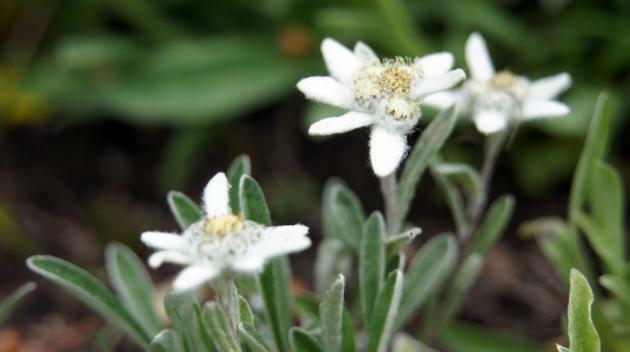 The Botanical Alpine Garden opened in 1929, 8,000 square metres abloom with 600 native species of flowering plants and, at lunchtime, there’s a performance of the traditional alphorn. 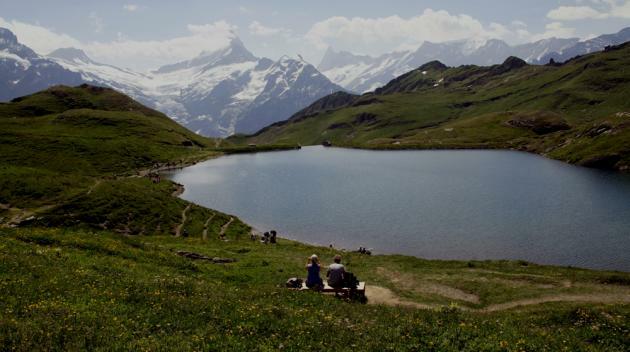 Your schedule should also make time for a hike around Grindelwald First, 2,200 metres up and with an aerial cableway to coast through the wind. The views of the Alps and valleys are again spectacular, the cowbells ringing clear as a – well, a bell. Your fitness-tracking wristwatch will count more than 10,000 steps to deep-blue Lake Bachalpsee, “the Pearl of the Alps”, the appearance of which makes any fatigue evaporate. On the way back you can ride the thrilling First Flyer zip-line or a scooter-bike known as the Trotti bike. Finally, to complete your Swiss odyssey, treat yourself to a luxury Swiss timepiece at the Kirchhoffer boutique – or at least some unforgettable Swiss chocolate from Lindt.